How to prepare for your Trash the dress in the Riviera Maya and Cancun. I am sure having looked at the images, especially the underwater, and having been blown away by them as the day comes closer, or perhaps you are reading whilst trying to decide if a Trash the Dress is right for you, but either way I am sure you have LOADS of questions. Here I am going to attempt to answer some of the common questions as well as give you a guide of all the things you will need to do to get ready for a Mexican underwater Trash the Dress and what you will need to bring along with you. Q. Will my dress be damaged? Q. How long is a TTD shoot? Q. How will I actually know what to do when I am underwater and how long will I be underwater for? A. Firstly, you are generally just under the surface of the water and will be able to touch the ground with your head above water at all time unless you want to go deeper and your wedding dress is the kind you can swim in easily… so generally you will just have your head underwater for just a few seconds at a time. As for knowing what to do, every time you pop your head out of the water Dean will give you direction and as you are shooting will show you images on the back of the camera to better explain what he is looking for… you’ll be amazed how quickly you get the hang of it. Q. Is there anything I can do beforehand from a swimming perspective that will make it easier? If you have other questions, please do not hesitate to email us and we will do our best to make sure you have a great underwater trash the dress session. This leads us on nicely to what you will need to do to get ready beforehand. Waterproof makeup, especially eye makeup and mascara. You will want a make-up fixer (AKA Makeup stay, Model in a Bottle, etc.. ). This is also great to use for your wedding day and try Sephora and see what they recommend. Our preference is Urban Decay and Make-up-forever. Please read the blog post on beach bridal make-up and remember with HD photography heavy makeup really doesn’t work. It’s easier for us to fix an uncovered pimple in photoshop than to fix a pimple covered in caked on concealer. So lots of light layers of products and go for a glow rather than a mat finish. Also, bear in mind the water softens EVERYTHING so even if you feel a bit tired after a big party, you won’t see that underwater. Hair. For TTD’s we prefer your hair up. It’s not nearly as important as it is for your wedding day, however, if you have long hair and it is down, it might be a challenge to keep it out of your face underwater. Not impossible, simply a challenge. Finally, don’t forget any props you might want to bring. Parasols, fabric flowers, coloured fabric to swirl around you, sombreros, coloured ray-bans or anything else that takes your fancy. And please, if you have specific ideas in mind create a Pinterest gallery or collection of images for Dean to take a look at before the day of the shoot. Now, on the day here is a list of what you will need to do and bring with you. Please have your hair and make-up done and preferably dress on before Dean arrives at the resort. Remember to bring towels and a change of clothes. Bring snacks and a drink. Its a long day and you will be hungry and tired by the end of it. If you ask your resort in advance they should be able to prepare a lunch for you. 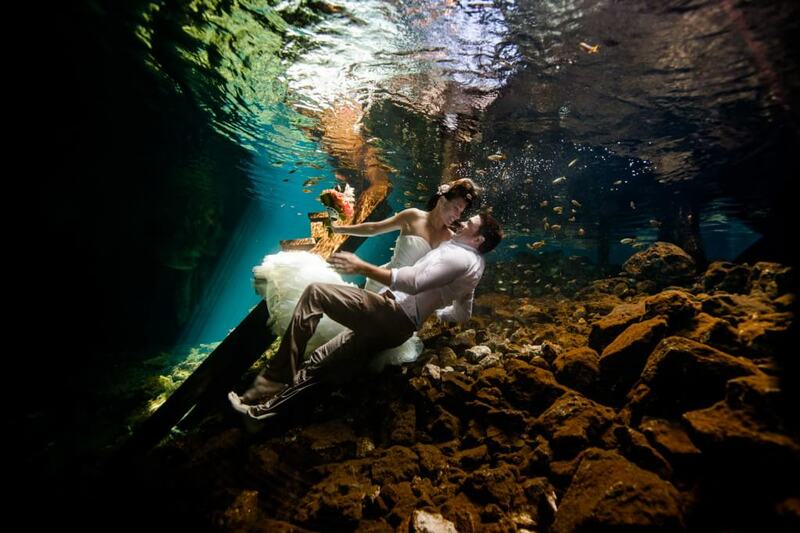 Bring your bouquet and your veil… they look beautiful underwater! Don’t forget your props if you want to bring any! And now for the silver lining, if you ever wanted an excuse to buy a glamorous white bikini but in the past you haven’t because they aren’t very practical, this is it…. its the best thing to wear under your dress… just make sure it doesn’t have too many ties or dangles that interfere with the line of the dress…. The most important thing is that you have FUN, and enjoy yourselves….. most of our clients say the Underwater Trash The Dress is the highlight of all their Mexico wedding photography so please enjoy it.